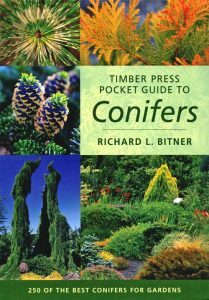 Timber Press pocket guide to conifers. Conifers are the perfect choice for ground covers, shrubs, or trees in almost any garden. Evergreen and always architecturally interesting, they’re also drought, pest-, and disease-resistant, and rarely have any demanding cultivation needs. This guide is the perfect companion for anyone who needs a portable guide to conifer choices. 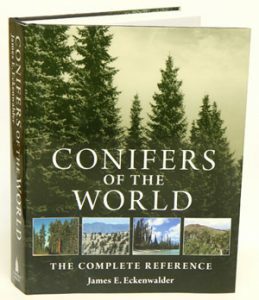 Conifers of the world: the complete reference. This definitive work provides up-to-date descriptions of all the true conifers of the world. It is the first comprehensive update of conifer taxonomy in nearly a century. Noted conifer taxonomist James E. Eckenwalder discusses the relationships, practical usages, champion trees, fossil occurrences, and biology. New identification guides for the families and genera are based on foliage features and are easier to use than traditional conifer keys. Eckenwalder shares the reasoning behind his taxonomic decisions, many of which are unique to this book, reflecting a comprehensive re-evaluation of conifer classification. He also outlines the features sought in cultivars of each genus, particular cultivation concerns, and conifers recommended for cultivation under various conditions and to achieve different effects. With its unprecedented attention to detail and extensive bibliography, this major work is an essential reference for botanists, naturalists, and horticulturists. 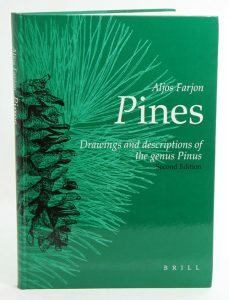 Farjon’s (scientist/taxonomist, Royal Botanic Gardens, Kew) love of pine trees is apparent in this oversize (9×12.75″) volume, particularly in his detailed, finely rendered drawings of the trees, their needles, branches, and cones. This second edition begins with an overview of pines in general: information on botanical characteristics, classification. 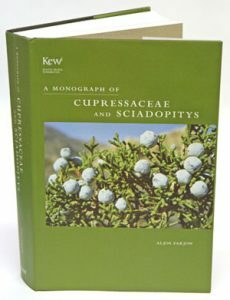 Monograph of Cupressaceae and Sciadopitys. Consisting of 30 genera and 133 species, this is the only Gymnosperm family with world-wide distribution. All species are described with information on nomenclature, types, distribution, ecology, conservation, cited specimens, taxonomic notes and distribution maps. Introductory chapters deal with history, morphology and anatomy, phylogeny and evolution, and distribution. The author’s beautiful full-page line drawings, of every species, are superbly reproduced. 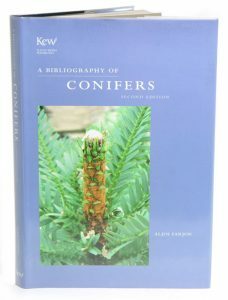 First published in 1990, this second edition of Bibliography of conifers has been greatly expanded from 2,130 to 3,787 references to published literature. To make it more accessible, many more general titles have been added – including coverage of Araucariaceae, Cupressaceae and Pinaceae and subjects related to their taxonomy. A new index to taxon names, referenced to the bibliography, greatly facilitates finding literature related to specific taxa. In mid-1994 a National Parks & Wildlife ranger abseiling in the Wollemi Wilderness outside Sydney, came upon an extraordinary sight: a canyon filled with massive pines. These trees towered above the surrounding foliage, with fern-like leaves and peculiar lumpy bark. What he accidentally discovered that day has become one of the century’s most important botanical finds. The ancient pines were thought to have become extinct millions of years ago. The Director of Sydney’s Royal Botanic Gardens described the discovery as ‘the equivalent of finding a small dinosaur still alive on Earth’. This enthralling detective story about evolution and natural history was the first book by the award-winning science writer, James Woodford. 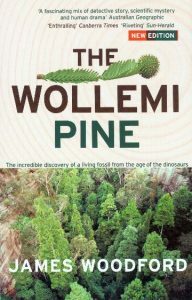 The overnight celebrity and Australian icon that the world now knows as the Wollemi Pine has been studied, cloned and carefully raised and will soon be available commercially for the first time—an auction of the first release of these living fossils was held in late 2005. This edition of The Wollemi Pine features a new chapter which examines the progress of the pine’s reintroduction into civilisation, and some of the challenges and issues involved in its commercial propagation.